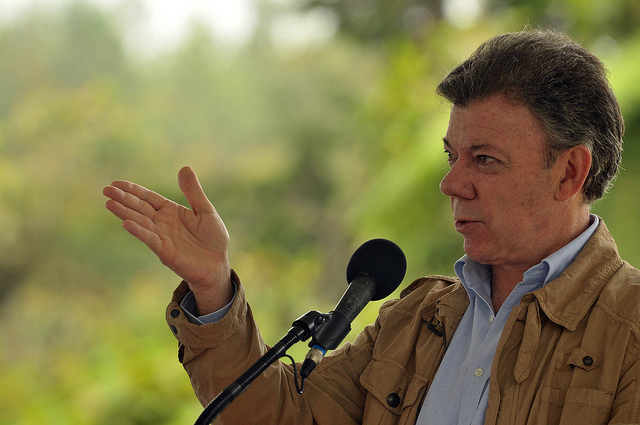 Last month in Havana, Colombia’s President Juan Manuel Santos claimed  that ‘on 23 March 2016, we will be bidding farewell to the longest-running conflict in the Americas’—something indeed that Colombians have long wished for. Colombia’s 51-year-old fight against the Revolutionary Armed Forces of Colombia (FARC-EP) and its vast trail of destruction  appears to finally be coming to an end. Colombia’s internal conflict  has at least claimed 220,000 lives, including 176,000 civilians. It’s made Colombia accountable for the world’s second-highest number of landmine victims, second only to Afghanistan. It’s displaced more than 5.7 million people—more than New Zealand’s entire population—and it’s been responsible for 27,000 kidnappings, over 5,000 cases of forced disappearances and over 1,000 massacres. This isn’t the first time the Colombian Government has tried to bring conflict to an end, though. Five Colombian presidents  have unfruitfully attempted to strike a peace deal with FARC rebels since 1981. And despite the words of the current negotiation team  ‘nothing is agreed until everything is agreed’, President Santos’ statement suggests his three-year-old peace process has finally passed the point of no return. The breakthrough came with the Joint Communiqué # 60 regarding the Agreement for the creation of a Special Jurisdiction for Peace  (SJP), in which President Santos and FARC’s highest commander, Rodrigo Londoño—known as Timochenko—announced that both sides had agreed on a formula for transitional justice. That was perhaps the biggest hurdle in the agenda . This SJP will seek to punish every actor directly or indirectly involved in the conflict while ensuring the victims’ rights are restored, truth is disclosed and, ultimately, that conflict of this magnitude never occurs again. Those three elements are indispensable to access any special justice treatment the jurisdiction creates, and have now become the cornerstone of building a stable and strong peace in Colombia. But practically speaking, the SPJ would create important incentives for violators to confess to their crimes while the Colombian State grants the broadest possible amnesty for political and related offences. That means that crimes which violate international treaties and laws won’t be subject to amnesty. Those admitting responsibility to war crimes and crimes against humanity could face a maximum of five to eight years of restricted liberty under specific conditions. Those who don’t could face 20 years of ordinary imprisonment. As those specific conditions are still to be determined, criticism and the questions about impunity arise. Colombia’s Former President—and foremost critic of the peace process—Alvaro Uribe said  ‘Santos is not the peace that is near, it’s Colombia’s surrender to FARC’. Jose Miguel Vivanco, the US director at Human Rights Watch (HRW) said  that the SJP would allow those most responsible for mass atrocities to completely avoid prison, effectively denying their victims their right to justice. Those are genuine concerns. Colombia’s Attorney General Department (AGD) estimates  that there are 11,269 cases involving over 16,000 FARC rebels, and are currently investigating the alleged commission of over 58,000 war crimes and crimes against humanity. And one of the consequences of the SJP involves freedom for at least 1,600 rebels of the 1,800 that are currently arrested and convicted. Another issue is drug trafficking. In the aftermath of the announcement, Colombia’s Supreme Court also decided  that drug trafficking will be considered a political crime, leaving the door open for amnesty and for FARC rebels to skip extradition. But that’s no surprise. As President Santos said bluntly in March : ‘I don’t believe that any guerrilla is going to turn in his weapon only to go and die in a US jail’. In spite all this, the preliminary agreement was  seen as favourable to the US—Colombia’s long-standing ally in the war against drugs– and also among members of the international community. But most importantly, Colombians will have the final word on what is ultimately agreed, through a referendum or a similar mechanism. Finding the right balance between justice and amnesty is a colossal challenge that comes with peacemaking. But the pain that millions have endured for over 50 years is now being given a chance to heal. The preliminary deal commits FARC rebels to sign a final deal by March next year and lay down their weapons 60 days after the broad agreement is reached. After the unprecedented announcement, President Santos and Timoshenko, both dressed in white, in a symbolic gesture, sealed their partnership by shaking hands . Peace in Colombia isn’t only possible now, it’s necessary. However, peacemaking and peacebuilding are different things. A peace treaty will ratify the collective sentiment of walking towards a new Colombia, but post-conflict scenarios aren’t easy terrain. A thorny path may still lie ahead. Among the various challenges policymakers are likely to face, an organised crime escalation with international implications may sit high on the priority list of law-enforcement agencies. The demobilisation of the United Self-Defense Forces of Colombia (AUC)  that started in 2003 is a not distant reminder of this. And let’s not forget that FARC ranks third  on a list produced by Forbes on the world’s richest ‘terrorist’ groups, with the Islamic State (ISIS) and Hamas taking the top two spots. I will discuss the likelihood of an organised crime escalation in Colombia’s post-FARC era in a second post. Cesar Alvarez is a visiting fellow at ASPI. Image courtesy of Flickr user Ministerio TIC Colombia.